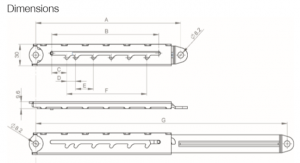 All Cam‐Stay telescopic positioning stays are universal and can be mounted with the holding slots mounted up or down. Mounting of the stays can either be directly to your application through the holes or by mounting brackets. Cam‐Shoc dampers are self‐contained, maintenance‐free, hydraulic damping units. They are designed and engineered to absorb, meter and control kinetic energy.